At least 25 people are sick with Salmonella infections linked to recalled Coconut Tree brand frozen shredded coconut, according to the Centers for Disease Control and Prevention (CDC). Six people have been hospitalized because their illnesses are so serious. No deaths have been reported. 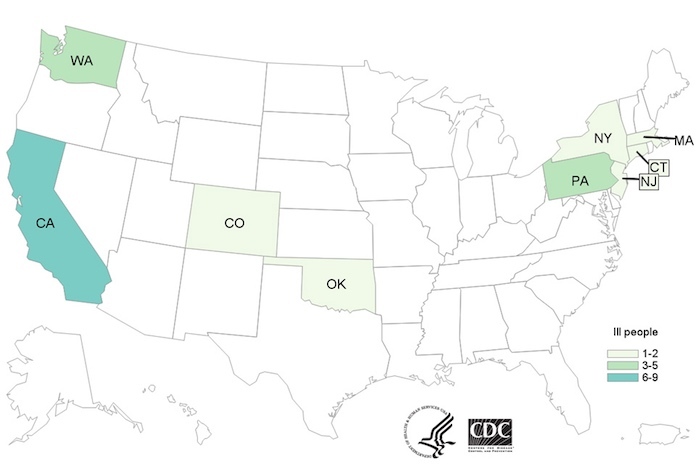 This Salmonella coconut outbreak is scattered across the country. The case count by state is: California (9), Colorado (1), Connecticut (1), Massachusetts (2), New Jersey (1), New York (1), Oklahoma (1), Pennsylvania (5), and Washington (4). Illnesses started on dates ranging from May 11, 2017 to November 4, 2017. The patient age range is from 1 year to 82. The bacteria causing these illnesses have been identified as Salmonella I 4,,12:b:- and Salmonella Newport. Epidemiologic, laboratory, and traceback evidence indicates that Coconut Tree brand Frozen Shredded Coconut, distributed by Evershing International Trading Company, is the likely source of this outbreak. Food Poisoning Bulletin told you about a strange beginning to this outbreak last week. The Massachusetts Department of Health was investigating a single case of Salmonella food poisoning. Officials found a rare strain of the bacteria in the Coconut Tree product. That frozen coconut has been recalled. On January 3, 2017, the FDA published a recall notice. All of the 16 ounce bags of Coconut Tree frozen shredded coconut currently on the market has been recalled. Investigators are using the PulseNet system to identify any more patients who may be part of this outbreak. Whole genome sequencing (WGS) has shown that isolates from patients infected with the Salmonella I 4,,12:b:- strain are closely related genetically. That means people in this outbreak likely share a common source of infection. In interviews, ten of sixteen people said they ate or maybe ate coconut the week before they got sick. Of those ten people, eight said they had an Asian-style dessert drink that contained frozen shredded coconut. State and local health officials have collected foods from restaurants where the patients consumed those drinks. In November 20017, oak testing of a sample of coconut milk made in one New York restaurant did not identify the outbreak strain of Salmonella I 4,,12:b:-, but did find a strain of Salmonella Newport. That milk was made with Coconut Tree brand frozen shredded coconut. The Salmonella Newport in the coconut milk was closely related genetically to an ill person in Massachusetts who had consumed an Asian-style dessert drink. Then, officials in Massachusetts collected food items from the restaurant that person had visited. One sample from frozen shredded coconut found a strain of Salmonella that was new to the PulseNet database and has not been linked to any illnesses. The Coconut Tree brand frozen shredded coconut was then recalled. Finally, on January 12, 2018, lab testing confirmed that samples from that frozen shredded coconut from that restaurant identified the outbreak strain of Salmonella I 4,,12:b:-. Other samples of the unopened packages of Coconut Tree frozen coconut sold before January 3, 2018 yielded Salmonella Javiana, Salmonella Risen, and Salmonella Thompson. This recalled frozen shredded coconut may still be in consumer’s freezers. Check your freezer to see if you have this product. If you do, throw it away in a sealed container, or take it back to the store where you bought it for a refund. Wash your hands well with soap and water after handling this product. The symptoms of a Salmonella infection include abdominal and stomach pains and cramps, diarrhea that may be bloody, nausea, vomiting, and a fever. If you or someone you know has been experiencing these symptoms, especially if you have consumed frozen coconut, see your doctor. The long term complications of a Salmonella infection can include reactive arthritis or inflammatory bowel disease. If you or a loved one have been sickened with a Salmonella infection after eating Coconut Tree frozen shredded coconut, contact our experienced attorneys for help at 1-888-377-8900. 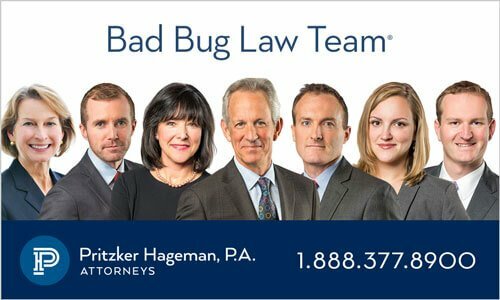 Pritzker Hageman, America’s food safety law firm, successfully represents people harmed by adulterated products in food poisoning outbreaks throughout the United States. Its lawyers have won hundreds of millions of dollars for survivors of foodborne illness and their families, including the largest verdict in American history for a child injured by E. coli and hemolytic uremic syndrome. The firm also publishes the site Food Poisoning Bulletin, a respected source for food safety news and information. Pritzker Hageman lawyers are regularly interviewed by major news outlets including CNN, the New York Times, and the Wall Street Journal. The firm also represents people harmed by pathogenic microorganisms in Legionnaires‘ disease, surgical site infection, and product liability cases.